Major General (MG) Jeff Clark was born in LaGrange, North Carolina and is a graduate of Davidson College, East Carolina University School of Medicine, the US Army Command and General Staff College and Army War College. MG Clark earned a Master of Public Health at the University of Washington and a Master of Strategic Studies at the Army War College. He is board certified in Family Medicine. 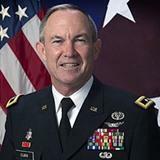 He commanded Europe Regional Medical Command and served as US Army Europe Command Surgeon until July 2013. MG Clark served as Director, Walter Reed National Military Medical Center 2013- 2015. MG Clark was the Interim Director, National Capital Region Medical Directorate from October 2015 through February 2016 before assuming his current role. Check out the incredible speaker line-up to see who will be joining Jeffery.